Preheat over to 400 degrees. Spray cookie sheet with sides (jelly roll pans) with flour/grease mixture. Lay wax paper on top of this and then spray the top with the same mixture. Lay out clean dishtowel on counter. Dust towel with confectionary sugar. Beat egg whites with salt until they stand in soft peaks. Add four tablespoons sugar, on at a time, and continue beating until meringue is very stiff. In a separate bowl, beat egg yolks with remining sugar and vanilla until fluffy. 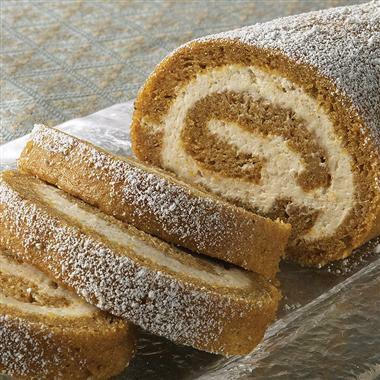 For pumpkin roll, add 1/2 cup canned pumpkin to egg yolk mixture and continue beating until fluffy. Gently fold about 1/4 of the meringue into the egg yolk mixture. This makes the yolk mixture lighter. Pur back into bowl of meringue. Sprinkle with two tablespoons of flour/or cake mixture and fold by hand into meringue mixture. Continue folding in until flour/or cake mixture is gone. Do not over mix. Bake 10-12 minutes in the 400 degree oven until golden. As soon as the cake is baked, remove it from oven and invert it onto the towel, waxed paper on top. Do NOT remove the waxed paper. Roll cake tightly in towel starting at the narrow end. Allow to cool. Carefully unroll cake and peel off waxed paper. Spread thin layer of frosting on the top. Add whipped cream or Cool Whip (flavored with pumpkin). Reroll and refrigerate for an hour. Frost outside of cake as desired.